The best deal on Tracfone Service is available from the Tracfone.com web site. You can purchase Tracfones and Track Phone Minute cards at almost any national chain store. Walmart, K-Mart, Sears, 7-Eleven, Safeway, almost any chain store anywhere in the US. When you purchase a phone and phone card at the TracFone.com Web Site you will be getting the most service time for the least money. Your phone plan will include Minutes and Service Time. With most of the Tracfone Cards you will get 90 days of service time. The larger Minute Cards will give you more minutes per dollar. You will need to add a minute card before you run out of either minutes or service time. If you let either fully expire you will lose your phone number. Get a LG 225 phone and One Year of Tracfone Service for $99.99. This is one of the best values that Tracfone offers. You get a New LG 225 with DMFL and a One Year Card. The card gives you 400 minutes that double to 800. You can usually find a bonus code to get an extra 200 to 300 minutes. When you activate the phone you will get two months and adding the One Year card will net you 14 months of service. Double Minutes for Life (DMFL) is a new program that Tracfone has instituted. Any phone card you add to a DMFL phone will get twice the number of minutes on the phone. You can also use bonus codes to get even more minutes. Double Minutes is so powerful at saving you money, I do not recommend adding minutes to a phone that does not have it. You can purchase a DMFL Card for $50 but you are better off to buy TracFone Ultimate Bundle: Get FREE LG 225 phone with the purchase of a one year card and save $100! 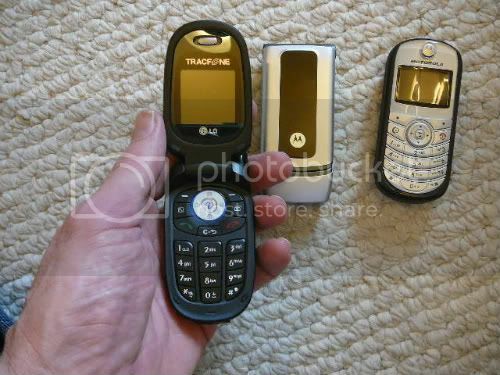 Tracfone Lg 225 with Motorola W370 and C139.